Come on and have a laugh with Chigwell's most famous daughters with Series 1 & 2 of the new BIRDS OF A FEATHER. 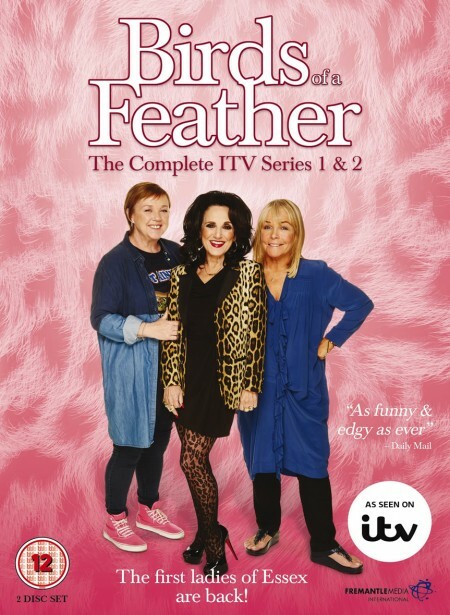 Series 1 includes Extras exclusive to the DVD: Behind the scenes interviews with cast and crew including Pauline Quirke, Linda Robson, Lesley Joseph. Series 2: The Birds are back for another series of laugh-out-loud and bittersweet adventures. Kicking off with a promised Christmas trip to Tenerife, courtesy of Dorien's continued income as "Sixty Shades of Green" author Foxy Cohen, the girls share their many successes and failures, including Sharon's interview to become a spy, Tracey's trip to jail and a traditional cockney knees-up with London's Pearly Kings and Queens. But there are life-changing surprises too as Dorien comes face-to-face with someone she thought she'd never see again and a heart-stopping scare for both the Chigwell sisters in a poignant and hilarious two-part finale. All 16 episodes of the two series are included in this 2 disc DVD set.